Quartissimo consists of flute, violin, viola and cello, and has an extra special sound which is a little different from the traditional string quartet. All experienced professionals working with the topflight orchestras and ensembles in the Scottish music scene, as a group, they have performed both in recital and as subtle background entertainment in many of the major venues around Scotland. 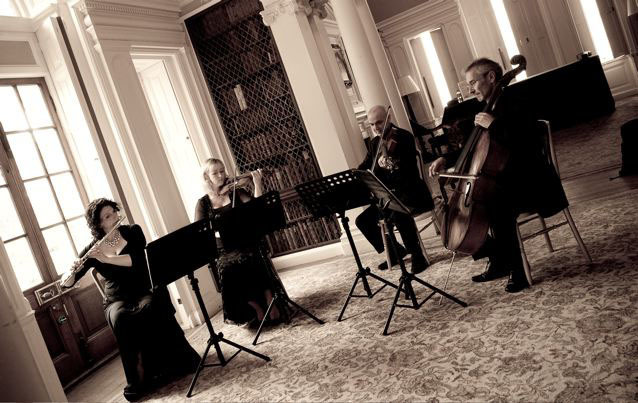 They will play for your wedding, corporate event or even private function and are delighted to tailor the programme to suit your needs and musical tastes. They have an extensive repertoire of incidental music in varying styles to suit every special occasion. Choose from their vast collection of music, which includes classical, popular classics, standards and also many arrangements of pop tunes. The members of Quartissimo look forward to bringing some sophisticated entertainment to you and your valued guests.